Hudaydah(ANN)-A video shows Sudanese mercenaries fighting alongside Saudi-led forces against Houthi Ansarullah forces in Yemen’s eastern province of Hudaydah. 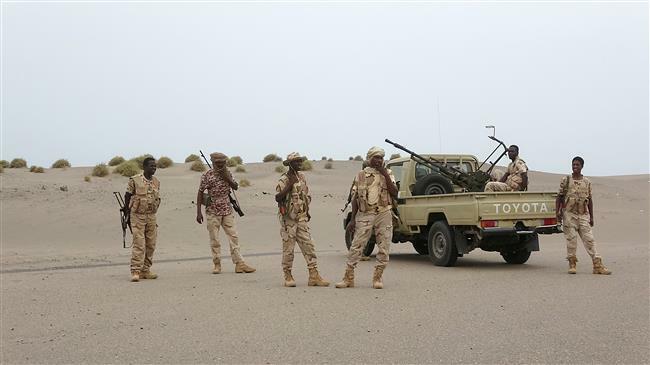 The presence of Sudanese forces in Yemen comes despite Sudan’s announcement last month about assessing whether to continue its participation in the Yemen war or downgrade its presence in the military campaign led by Saudi Arabia. Domestic voices in the North African country have long urged a withdrawal from the Saudi-led coalition and those calls gained momentum after three senior Sudanese officers and scores of soldiers were killed during a battle in northern Yemen on April 10. Nearly 15,000 people, mostly civilians, have been killed in Saudi-led airstrikes and other attacks since the war started in March 2015. The campaign lacks any international mandate and rights groups and governments around the world continue to criticize those involved in the war, including the United Arab Emirates and Sudan. Sudan’s Akhbar el-Youm newspaper has quoted informed sources as saying that there is a strong trend among the leaders of the state to withdraw Sudanese forces from Yemen amid mounting pressure. The report has also revealed that the Sudanese troops fighting in Yemen have not received their salaries from Riyadh. However, a full withdrawal is unlikely to happen as President Omar al-Bashir, who has cultivated close ties to Riyadh in the hope Saudis could help shore up economic situation in Sudan, has on several occasions stressed his intention to continue participating in the Yemen war.